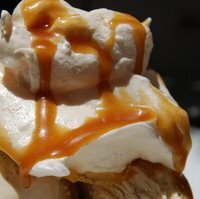 Butterscotch Sauce or create your own sundae with meringue, ice cream and fresh fruit. They can be stored in an airtight container for 3 - 4 weeks, but ours never last that long, and are a great standby as an emergency dessert. 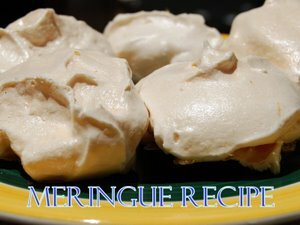 Whisk the egg whites with an electric hand mixer or with the whisk attachment of a food processor , until the mixture forms soft peaks. While continuing whisking, add the sugar gradually, spoon by spoon and continue whisking until reasonably stiff peaks form. Using a dessert spoon, scoop 12 blobs of the mixture onto a baking sheet covered with oiled greaseproof paper or foil. Make sure that you leave about an inch gap between each one. Bake for 3 1/2 - 4 Hours on the middle shelf, until they are pale golden brown and crispy on the outside. Once cold, remove from foil/paper and store in air-tight container.